Did you know that you can use your iPad as a second screen for your Mac? That’s right. You can buy DuetDisplay, currently $11, and use it to connect your iPad to your Mac so you can use it as an second display. In a sense, this is a way to control your Mac using a touch-interface, if you would like to try this. Apple indicates that they have no plans to make touch-based Macs so if you’d like to have touch-control of your Mac this is the only way I know to make it happen. Here are basic setup instructions. Download the free Duet app for your Mac. Duet currently requires OS X Mavericks (aka OS X 10.9) of higher. Install the Duet app on your Mac, this will require a restart. Meanwhile, buy Duet in the App Store and install it on your iPad. Duet currently requires iOS 7.0 or higher. Connect your iPad to your Mac using either its Lightning or 30-pin cable. Open the Duet app on your iPad. Open the Duet application on your Mac, you’ll see the Duet menu icon appear on the Menu Bar in the upper right corner. That’s it. This also works with iPhones, but I’m not sure how useful it would be to connect an iPhone to a Mac. 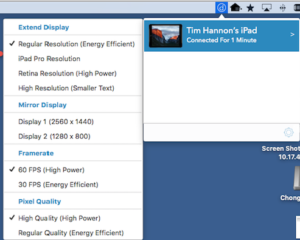 I should add that if you own a PC you can use an iPad or iPhone as a second display on your PC, too. It’s useful to know that you can adjust the arrangement of the two displays by clicking on the Apple menu, selecting System Preferences and clicking on Displays. Here, you can place the iPad, the second display on either the left or right-side of your Mac’s built-in screen. On the iPad, Duet is an app, just like any other iPad app. This means, that you can switch from Duet to any other iPad app. In other words, you aren’t locking your iPad into a special mode, as a second display. You can open up any other app on your iPad if you want to use it for a few minutes. Then switch back to Duet and you see your Mac’s extended display. Read more about display, extend, iPad, mac, second.